Your follow up communication and demos aim to convert leads into sales. Your conversion rate for any one of these is, basically, the percentage of people you change (convert) from the former into the latter. The ultimate goal of any marketing campaign is, of course, to increase sales. This means that tracking trends in sales revenue is a vital marketing KPI – and one you shouldn’t lose sight of. However, just knowing the total sales figures doesn’t massively help you to understand what elements of your marketing strategy are working. For that, you’ll need more detailed metrics. Tracking your conversion rates in each stage of the marketing and sales process helps you to identify specific pain points, establishing what’s working and what’s not, so that you can continually hone your marketing strategy. This depends on which conversion rate you’re measuring. Let’s take social media campaign click-throughs and conversions. While this varies by industry, social media advertising is fast becoming a core component of many campaigns, and an important fixture on your marketing KPI dashboard. When you’re dealing with multiple marketing channels, you need to segment the way you measure traffic, interactions and conversions to gain a more detailed picture. 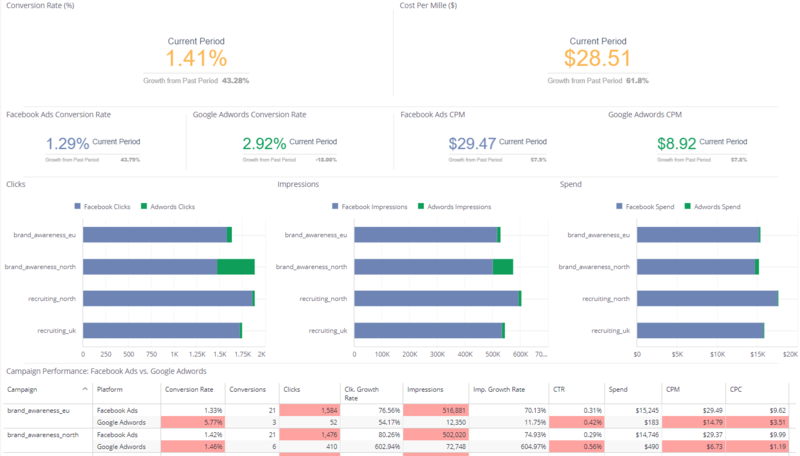 Using a data visualization tool can help you to compare at a glance how ads and sponsored posts perform on different platforms, including Facebook, Twitter, Google Ads, and LinkedIn. Depending on which conversion rates you are measuring, you might combine data streams from these sites with Google Analytics / Adwords and Salesforce or your CRM. Imagine you place paid ads on a number of different social media sites, and you want to figure out which ones bring the best ROI so that you can better direct your marketing budget. For that, you need a complete picture of which social media click-throughs ultimately convert into sales. To do this, you could track inbound traffic from various different social media platforms and campaigns, and cross-reference these with your sales data to figure out which channels led to the most sales conversions. You then have a clear idea of which ones work best for you – and you can easily manipulate the data and introduce sub-categories to gain more granular insights, for example, breaking down performance by region. Improving the click through to sales ratio for a specific channel or campaign.